In the letter, protesters alleged that the Friday prayers in Sector 53 were being used as a pretext to occupy land illegally. They further alleged that worshippers chant anti-India and pro-Pakistan slogans at the spot. 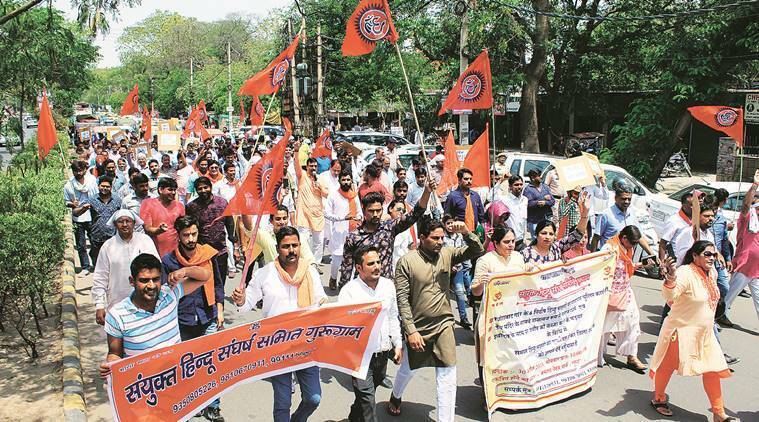 Several outfits, under the ambit of the Sanyukt Hindu Sangharsh Samiti, staged a demonstration in Gurgaon on Monday morning, demanding that a case registered against six men for disrupting namaz be withdrawn, and a city-wide ban be implemented on reading namaz in the open. The six men had disrupted the namaz, being read in a vacant plot in Sector 53, on April 20. Office bearers and workers of the outfits also threatened to take to the streets on Friday to ensure prayers are no longer held in the open. In the morning, around 50 protesters gathered at Kamla Nehru Park around 10.30 am, and marched to the Mini Secretariat, where a letter, addressed to Chief Minister Manohar Lal Khattar, was submitted to deputy commissioner Vinay Pratap Singh. “For the last one-and-a-half months, a group of men have been reading namaz on the land of Wazirabad, Gurgaon, with the intention of occupying it illegally. The environment there is being ruined by chanting slogans of ‘Pakistan zindabad’ and “Hindustan murdabad’,” the outfits alleged in the letter. “When some patriotic youth stopped them from doing this, police conducted a one-sided investigation. Does chanting ‘Vande Matram’ and ‘Jai Shri Ram’ come in the ambit of offence that the youth were arrested?” they said in the letter. Those who have been gathering at the spot to read the namaz each Friday for the last 10 years denied the allegations. “We don’t even talk to each other when reading the namaz; chanting slogans is out of the question. These are just false allegations,” said Wajid Khan, who heads the Nehru Yuva Sangathan Welfare Society Charitable Trust, and was the complainant in the case. On April 20, a group of men had arrived at the vacant plot minutes before prayers began. A video of the incident, which had surfaced on social media, captured them chanting “Jai Shri Ram” and “Radhe Radhe”, as they directed people to leave. A case had been registered last week. The accused were identified as Arun, Manish, Deepak, Rohit, Ravinder, and Monu — all residents of Wazirabad and Kanhai villages. They had been granted bail on Sunday. “We requested the district administration to declare a ban on reading namaz in the open. However, we intend to form teams and keep an eye on the city this Friday to ensure worshippers are not allowed to offer prayers in the open, on government land, illegally,” said Abhishek Gaur, district president of the Bajrang Dal, one of the protesting outfits. The deputy commissioner did not respond to calls and messages seeking a comment.